The World Bank forecasts the global economy will grow by 3% and 3.3% in 2015 and 2016 respectively, which is less than 3.4% and 3.5% it had predicted in June. Global GDP will then expand by a more moderate 3.2% in 2017, it adds. Britain’s FTSE 100 as well as other stock market indexes globally fell steeply after publication of the World Bank report. In its twice-yearly Global Economic Prospects report, the United Nations international financial institution blames sluggish growth in Japan, the Eurozone and some major emerging economies for its downward revision. Emerging economies have lost much of their past dynamism, while several high-income nations continue grappling with the remnants of the global financial crisis, the authors wrote. Source: World Bank Global Growth Infographic. The World Bank warned that global growth cannot be boosted by just one or two economies. Meanwhile, China is going through a carefully managed slowdown. Weak external demand undermined growth in several other emerging economies, which also underwent domestic policy tightening, supply-side constraints and political uncertainties. A number of key forces are driving worldwide economic prospects, including persistently low interest rates but increasingly divergent monetary policies across major economies, low commodity prices, and sluggish world trade. The steep fall in global crude oil prices since June 2014 will help bolster economic activity and help offset some of the negative headwinds for oil-importing emerging economies, such as India and China. However, the oil-price plunge will undermine growth prospects for oil-exporting nations “with significant regional repercussions,” the report added. The advanced economies are likely to see GDP growth of 2.2% in 2015-17, which will be an increase from the 1.8% seen in 2014. Labor markets will gradually recover, financing costs will remain low, and fiscal consolidation will ebb. As the domestic headwinds that undermined GDP growth in 2014 ease in developing nations and the rebound in high-income countries slowly gathers pace, expansion in emerging economies is expected to gradually accelerate, increasing from 4.4% in 2014 to 4.8% in 2015 and 5.4% in 2017. Falling oil prices will result in diverging prospects for oil-importing and –exporting nations, particularly this year, the authors concluded. They expect Russian GDP to shrink by 2.9% in 2015 and expand by just 0.1% in 2016. The World Bank has set itself the aim of eliminating extreme poverty globally by 2030. 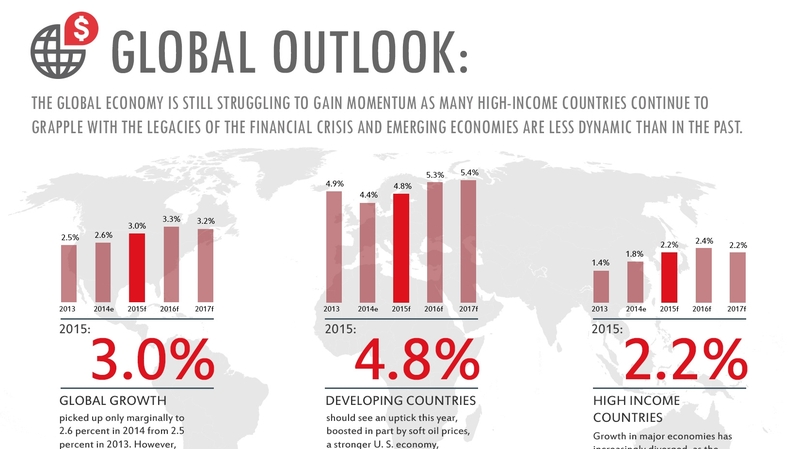 Citation: “Global Economic Prospects – Having Fiscal Space and Using It,” World Bank Group Flagship Report, January 2015.